Whilst you’re tucking into your next martini on the roof of Shoreditch House, cast an eye around you. This used to be the city’s most notorious, dismal slum. The most densely packed, sickly pack of streets in London. In 1890 the authorities set about one the first social programmes and razored the place to the ground to build the Queen Anne estate that radiates out from Arnold Circus. But without a stroke of a consultation with any residents they built the units far too large and expensive. With families clustered in room by room, there wasn’t a hope in hell they could stretch to a nice 2-bed pad overnight. So it was an overnight displacement of 6000 of the most poverty stricken desperate people. And so started the first wave of regeneration in the Ditch. The brilliant East-focused Bishopsgate Insitute has a talk coming up. “The most notorious novel of the ‘slum fiction’ genre, Morrison’s A Child of the Jago, caused outrage, with its nihilistic depiction of a population of criminals and social outcasts. Morrison claimed that it was an eyewitness account of the real Old Nichol district of Shoreditch. Two years after publication, the rows the book engendered were ongoing in the periodical press. 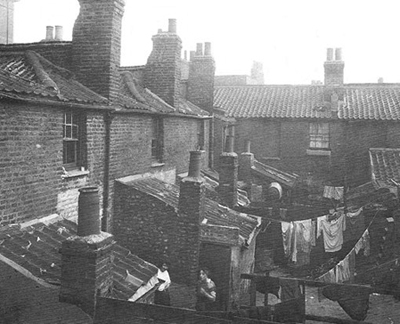 In this illustrated talk, author Sarah Wise (Inconvenient People, The Blackest Streets) explores the real slum that inspired his fantasy vision.